My ministry efforts through FCA are possible because of appreciated donors’ faithful prayer and financial support. We ask that you prayerfully consider helping us reach more athletes and coaches for Christ with your gift today. 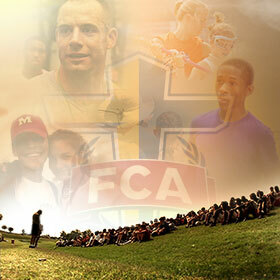 Your support can advance the FCA vision though our Four C’s of Ministry: Coaches, Camps, Campus and Community. Please feel free to contact me to learn more about our ministry efforts and specific areas in which you may have specific interest and questions. Since 1954, the Fellowship of Christian Athletes has been challenging coaches and athletes on the professional, college, high school, junior high and youth levels to use the powerful medium of athletics to see the world transformed by Jesus Christ. Through this shared passion for athletes and faith, lives are changed for current and future generations. Your partnership is greatly appreciated and will help advance the Gospel in your local area. FCA International desires to fulfill FCA’s vision, “To see the world impacted for Jesus Christ through the influence of coaches and athletes.” FCA International is working to increase its impact through partnering with existing international ministries and other sports ministries. Your partnership is greatly appreciated and will help advance the Gospel in this specific region of FCA International. Leave a comment, give as an organization, or leave your gift in honor of/in memory of someone. Would you like to make this gift a tribute? Please notify the family/recipient on my behalf. While every effort will be made to apply your gift according to an indicated preference, if any, FCA has complete discretion and control over the use of the donated funds.